The Zetas have explained that as the African Plate rolls, the plate border down through the Mediterranean will be pulled apart. ZetaTalk Prediction 10/16/2010: This time the African Plate will drop away significantly, slipping to the south during the roll. This movement is possible because as the South Atlantic Rift tears open, there is room for the tip of Africa to slid into that void, thus dropping the entire African Plate as it rolls. The African Plate not only moves to the south during this process, it also further to the west, although the southern portion of Africa moves more in this direction more than the parts abutting the Mediterranean. This is in process, but has not reached the point where this is measurable as yet. But what of the odd faint that a dozen passengers on an Air Europa flight from Spain to Israel experienced recently? 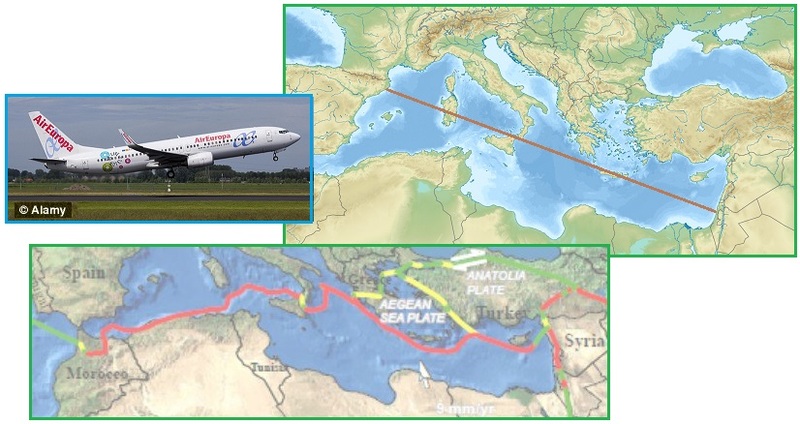 The flight path was along the African Plate border as it runs down through the Mediterranean Sea. Aircraft in flight pull air in from outside, and thus any methane gas from ruptures along the plate border would waft up and into the plane. The airline explanation, that this was kerosene from jet engines, is unheard of during flight. Passengers were feeling dizzy, but did not faint, after noticing a smell that was believed to be kerosene, which powers the jet's engines. All passengers left the aircraft on their own at destination. Almost 200 passengers and crew were on board the Boeing 737. One woman who fainted regained consciousness after water was poured on her, but said she soon lost consciousness a second time after feeling dizzy. She began to feel weak after the person sitting next to her adjusted the air conditioning control above their seat. There is 'no gas of any type' on the new generation of Boeing 737 aircraft, so the smell perceived by some passengers came from jet fuel. The smell of kerosene that some people perceived during flight is normal when the engines are started with headwind, but after short period of time that smell is always removed by the air conditioning system. No emergency was declared and the flight landed as scheduled. Methane does indeed cause sleepiness and faint, as was well documented in 2007 when methane sickness occurred over a broad swath of the Earth. This was interpreted to be a gas smell at the time, as a gas leak, but no gas leaks were ever located. On Jan 8, 2007 there were reports of what appeared to be a monstrous gas leak in New York City and nearby Jersey City. No gas leak was ever found. Rochester, NY reported 4 broken water mains during this same time frame. Marine tankers report their alarms for methane going off, but no leaks found. About a dozen people were taken to hospitals complaining of breathing problems. Then the reports from around the world started pouring in, all seeming to be happening simultaneously. Italy evacuated people from Genova and Bologna due to gas leaks, an explosion killing one. London closed their tube lines due to suspected gas leaks, smells. Australia had water main breaks in Adelaide, and gas smells evacuated a mall in Perth where several were hospitalized as a result. No gas leak was ever located. Here in the US reports came in from Ohio smells, and a factory explosion, cause unknown. Nashville, TN, gas line leak. Mobile, AL gas leak. Blue Springs, MO gas leak with explosion and evacuation. Dallas, TX smells and in Houston a factory fume leak, cause unknown, and in Austin dead birds, cause unknown. Iowa, a pond bubbling. Albuquerque, MN city evacuated due to gas smells. Half Moon Bay, CA evacuated due to smells, Santa Barbara marine tanker alarms due to methane, no leak found, and Oxnard freeway closed due to gas main break. ZetaTalk Explanation 1/9/2007: Do these fumes cause people to sicken, and birds to die? Mining operations of old had what they called the canary in a birdcage, to warn the miners of methane gas leaks. Birds are very sensitive to these fumes, and die. Gas leaks sicken, as the body was not structured to breathe such air for long. 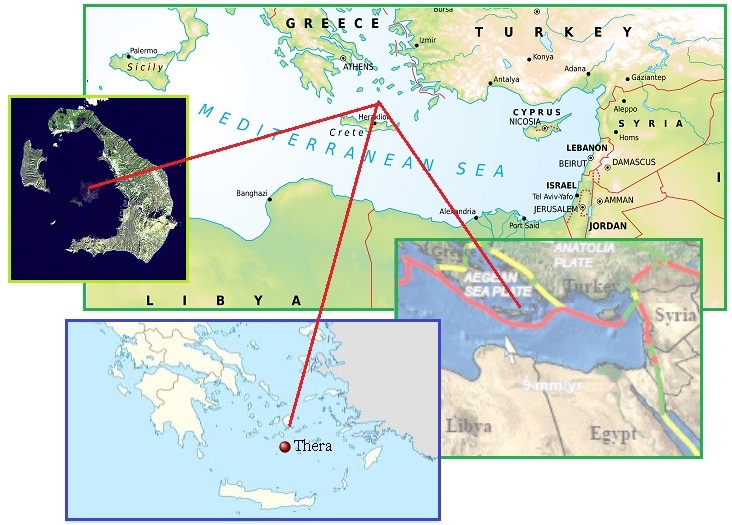 During the last Pole Shift, 3,600 years ago, the Mediterranean was torn violently apart at Crete, causing the eruption of Thera. So a rupturing Mediterranean should not be a surprise. The Minoan eruption of Thera, also referred to as the Thera eruption or Santorini eruption, was a major catastrophic volcanic eruption. 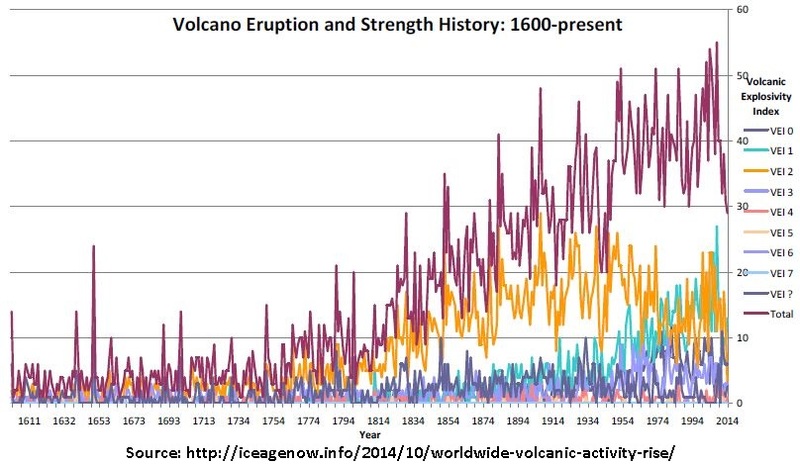 The eruption was one of the largest volcanic events on Earth in recorded history. The eruption devastated the island of Thera (also called Santorini), including the Minoan settlement at Akrotiri, as well as communities and agricultural areas on nearby islands and on the coast of Crete. The exact date of the eruption has been difficult to determine. Archaeologists have traditionally placed it at approximately 1500 BCE. Radiocarbon dates, including analysis of an olive branch buried beneath a lava flow from the volcano which gave a date between 1627 BCE and 1600 BCE, suggest a date over a century earlier. Thus, the radiocarbon dates and the archaeological dates are in substantial disagreement. There are no surviving Egyptian records of the eruption, and the absence of such records is sometimes attributed to the general disorder in Egypt. A volcanic winter from an eruption in the late 17th century BCE has been claimed by some researchers to correlate with entries in Chinese records documenting the collapse of the Xia dynasty in China. According to the Bamboo Annals, the collapse of the dynasty and the rise of the Shang dynasty, approximately dated to 1618 BCE, were accompanied by "yellow fog, a dim sun, then three suns, frost in July, famine, and the withering of all five cereals". As the 7 of 10 plate movements progress, volcanoes along the plate borders are increasingly erupting. The uptick in volcanic activity has been covered in past newsletters - inactive volcanos in Chile and in Pakistan suddenly erupting; the increase in Indonesia volcano eruptions as the Sunda Plate comes under pressure; the pathetic establishment excuses for the uptick in eruptions; and inactive volcanoes awakening in Colombia and Eucador. That an increased in occurring is undeniable. 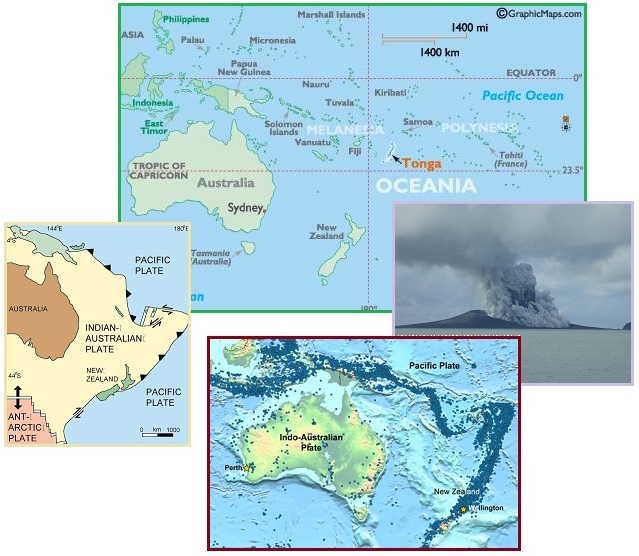 A new volcanic island is emerging at Tonga where the Indo-Australia Plate lifts. This is a zone of frequent and violent quakes. The island started forming in January after a volcano exploded underwater and then expanded creating a mile long, cone-shaped formation. The Hunga Tonga-Hunga Ha'apai underwater volcano, that created the formation, is located between two land masses in the Tonga archipelago - Hunga Tonga and Hunga Ha'apai. A new island is now growing at the eruption site between Hunga Ha’apai and Hunga Tonga Islands. The 7 of 10 plate movements start with the tilting of the Indo-Australia Plate, which plunges under the Himalayas and allows for the Sunda Plate tongue to be pressed under the curve formed by Sumatra and Java. This facilitates the S American Plate roll, so that the top part of the S American Plate tips westward, putting subduction stress along the spine of the Andes. The westward roll of the S America Plate combines with a compressing Pacific and widening Atlantic to put a bowing stress on the N American continent, pulling the tip of Mexico toward the Aleutian Islands and Kamchatka. Volcano Villarrica in southern Chile erupted in the early hours of Tuesday, sending ash and lava over 3,000-feet into the sky, and forcing the evacuation of nearby communities. The volcano, located near the popular tourist resort of Pucon around 750 km (460 miles) south of the capital Santiago, is one of South America's most active. It last erupted in 2000. For the second time in 10 days, the Popocatepetl volcano east of Mexico City spewed ash into the sky, forcing cancellation of flights at the nearby Puebla International Airport. A series of explosions at the volcano overnight tossed hot rocks 700 metres down the volcano's cone and sent a column of ash nearly 4 kilometres into the sky. Similar episodes were observed in May and July 2013, and likely have to do with the growth of a new dome. A very large vulcanian explosion occurred this morning at the volcano. The explosion produced a 1.5 km wide ash column rising to approx. 27,000 ft (9 km) altitude and several pyroclastic flows from partial column collapse that traveled to the south. Volcanic activity caused by the tearing of the Atlantic can be seen in the volcanoes of Iceland. The eruption was the largest in Iceland for over 200 years, dumping more than 1.4 cubic kilometers of basaltic lava over the barren landscape. 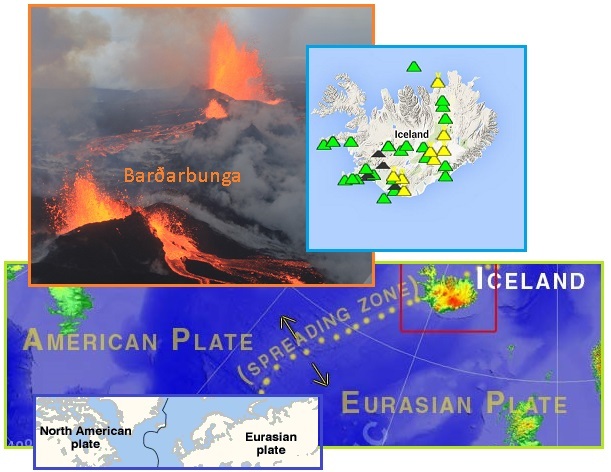 Along with the lava came unprecedented subsidence of the floor within the Barðarbunga caldera, an event that had never been observed (or measured precisely with GPS) in Iceland. In all senses of the word, this was a historic eruption. Iceland, the land of ice and fire, is a true paradise for volcanologists. In few places on earth, geology and human history are so closely connected to volcanism as on Iceland. The island owns its existence to a large volcanic hot spot sitting on a mid-oceanic ridge, a unique setting. The plate boundary between the American and Eurasian tectonic plates crosses Iceland from south to North and the spreading process can be directly measured and observed on land. They are considered innocents, as how could they not be? Tiny, helpless, dependent, unable to speak or have any kind of campaign against others – this is the conundrum of what to do with infants. Surely they should all be rescued, if not by humans then by benign aliens. 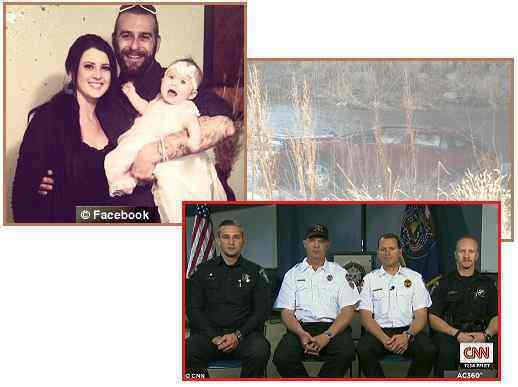 This issue was brought to the fore in March by the astonishing rescue of an 18 month old infant from the Spanish Fork river, where rescuers heard the dead mother’s voice calling out to “help me”. Only the unconscious infant was alive however, and recovered fully though suffering from hypothermia. Per the Zetas, this is an example of a soul-to-soul communication, similar to what occurs when humans see and hear ghosts. When firefighters and police officers arrived at the scene, near the junction of Main Street and Arrowhead Trail Road, they began wondering how to roll the car over from its upside-down position where it rested partially submerged in the slow moving water. “It was at that time we heard a distinct female voice from the car saying, ‘help me, help us,’ and that is when we said, ‘We’re trying to help you. We’re trying our best to get you out,’” said Officer Tyler Beddoes with the Spanish Fork Police Department. Four officers turned the car over, not an easy task since the vehicle wasn’t economy size. The firefighters climbed onto the top of the car to pry the door open. What they found after looking into the vehicle was a woman who looked like she died on impact in the driver seat, and a toddler who was unconscious and not breathing. The 18-month-old infant was strapped into her child safety seat. Warner was wearing a body camera and has seen the video. He said you can see them respond to the voice that created the sense of urgency to overturn the car and rescue Lily. Lily is in stable but critical condition at Primary Children’s Hospital in Salt Lake City. She was airlifted to the facility after being transported by ambulance to Mountain View Hospital in Payson. Did dead mother save her baby from beyond the grave? Three US cops claim mystery 'woman's voice' called to them from flooded car where they found baby alive beside her mother's body. The four officers who rescued an 18-month-old toddler from the wreck of a submerged car on Sunday said they launched into their heroics when they heard desperate pleas for help coming from a woman inside. But when the four men used all their strength to right the red Dodge sedan, they found little Lily Groesbeck to be the only passenger left alive in the vehicle. Her mother, 25-year-old Lynn Jennifer Groesbeck, had passed away the night before when she lost control of the car and could not possibly have called for the men to help save her child. A firefighter jumped into the river and cut the straps, freeing the blond baby girl who was wearing only a flannel onesie and no hat or gloves. Nobody knows exactly how the infant survived hanging upside down for nearly 14 hours in her car seat with no food or water. As she dangled, icy water rushed just below her head through broken car windows as the Dodge Caliber sat perched on the bank and rocks. The temperatures were near freezing throughout the night and through the morning. ZetaTalk Comment 3/14/2015: With several firefighters and police testifying that they heard a woman’s voice calling from the overturned car, there can be no doubt. Were they all temporarily insane? Was there a woman on the river bank or bridge throwing her voice? This motivated the men, who threw themselves into the freezing water with such enthusiasm that several of them had to be treated for hypothermia. Yet the mother was long dead, and the 18 month old infant, unconscious and cold, incapable of speaking the words “help me”. Was this a case of the mother’s spirit pleading for her infant to be rescued? Many such instances are of record, but proof of the spirit’s voice or form never seems to be solidly at hand. This is a spirit to spirit communication, with the rescuers receiving this message from their souls. We have mentioned that ghosts, or spirits, communicate in this manner, so that those seeing a ghost are not actually seeing something with their eyes, or hearing with their ears, but rather their brain matter is influenced to perceive this by the indwelling soul. Thus, the video recordings of the rescue will not record a voice. Nevertheless, the public, hearing this story, senses the truth of it. Sensing that little Lilly might have had more than her mother’s help - perhaps some benign aliens arranging to position the car such that she would not drown, or some guidance that allowed the fisherman to find the car before Lilly died from exposure – this situation begs the question. What of the coming Pole Shift, when so many small children will be left bereft, abandoned by parents gone insane or killed or simply saving themselves and leaving their dependents behind? If little Lilly was worthy, are these not also worthy? Per the Zetas, this is less confusing if one focuses on the soul incarnated, rather than on the age or circumstances of the physical body. Assistance is given to a highly Service-to-Other soul, regardless of age. According to statistics, about 35% of the world's population are children under the age of 14 years. Adults can fail to prepare, be in an unsafe place, abandon their children or the children may be lost, the parents may die, etc. But what of the Lift? If the Lift is for small children, what of the parents? Many parents can keep quite small infants in their arms, or they may be in maternity hospitals. How will they return after the Lift to the parents? Parents and children may be a different spiritual orientation, the child worthy but the parents perhaps not. ZetaTalk Comment 3/14/2015: There is much confusion about children – infants and young children – and their interaction with benign aliens. Conferences with the indwelling soul occur during all ages, and these conferences can include conferring with the Service-to-Self as well as the Service-to-Other. The only restriction in this regard is to the physical environment, where the Service-to-Self are not allowed to manipulate this in order to intimidate the young human. In that the quality of the soul is known, and a human infant can hold a mature Service-to-Other soul, an infant can and will be given the offer of a lift during the hour of the Pole Shift so their physical life not be ended. Of course, the vast majority of children on Earth currently have unsparked souls, or are undecided, so do not warrant an offer of a lift. As with all human life on Earth during the Pole Shift, they will either survive to live out their life in the Aftertime, or die to move onto the water planet where undecided souls from Earth will be transplanted into baby octopi. Unsparked souls, whether in human infants or adults, will dissipate upon death, as is the norm during spiritual development on all 3rd density worlds. Those souls who are judged to be Service-to-Self will be transplanted to prison planets upon death, and this includes any such souls that may be incarnated in human infants at the time. 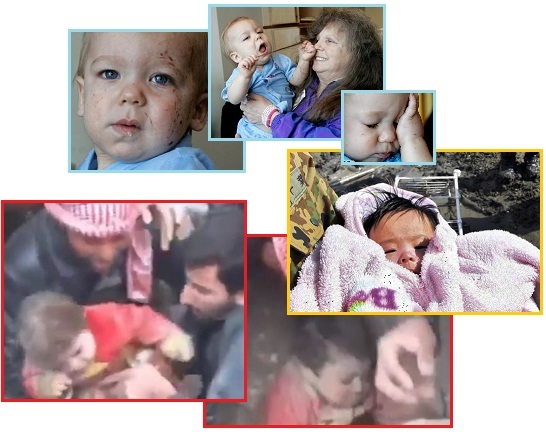 What of children and infants during the Aftertime, when so many will be orphans or surviving in desperate situations? If these children and infants are highly Service-to-Other, incarnated with these souls, they will get an assist from benign aliens (as was done during the Sumatra and Fukushima tsunamis and Haiti earthquake). They will live in high tech domes with ourselves and other benign aliens so they can participate in rescue and cleanup operations afterwards. But if not deemed worthy of this treatment, they will be left to live out their lives as life on Earth presents today for infants and children. The Transformation facilitates life for those in the Service-to-Other, but does not interfere with life otherwise. Those are the rules. Amid the silent corpses a baby cried out - and Japan met its tiniest miracle. The tidal wave literally swept the unnamed girl away from her parents' arms when it hit their home on March 11. Since then her parents - both of whom survived the disaster - have taken refuge in their wrecked house, and worried that their little girl was dead. Soldiers managed to reunite the baby with her overjoyed father shortly after the rescue. A firefighter in Tennessee was looking for survivors in a wreckage due to the tornado and made a discovery. He found a baby that was thrown a hundred yards alive with only minor injuries. The baby was in the middle of a field covered with debris and mud. It took a gasp of air and started to cry. The eleven-month-old baby was thrown a hundred yards when a tornado wrecked his home killing his mother. 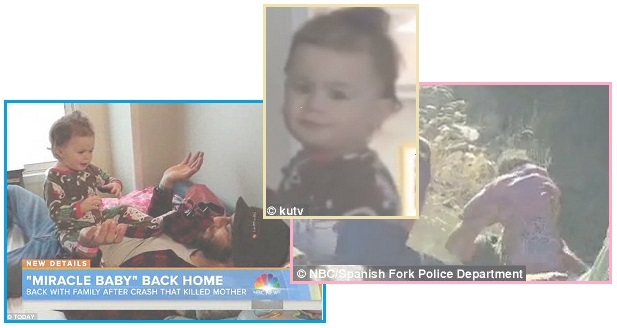 It's a miracle that the baby was found because the area was already searched once before and rescuers found nothing. They decided to search again after they sorted through debris and found a baby stroller. He is shown with his grandmother and great grandmother as his mother died in the storm. A two-month-old baby has been rescued from under rubble in the war-battered city of Aleppo in Syria. Video posted on to a social media website shows a group of men unearthing a baby from rubble in the Syrian town of Aleppo. Completely buried in the rubble, the baby can be seen being dug out by a group of men with their bare hands.